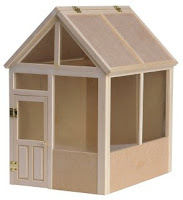 Because there are a limited amount of available modern dollhouse kits, some hobbyists take to kit bashing. 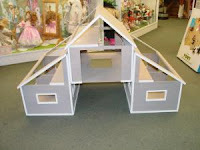 They purchase a standard dollhouse kit that has modern potential and get to work constructing mod abodes. 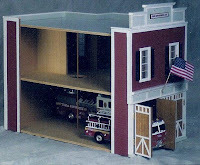 I think I’ve mentioned before that I lack craftsman skills, but I got it in my head that I was going to bash the Real Good Toys Firehouse kit. I had grand ideas in the vein of HGTV’s Generation Renovation show or their Restoration America project. 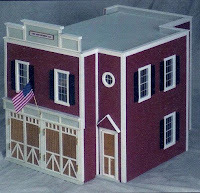 I was going to insert Plexiglas in the garage doors, switch out the front door and windows, add some cedar panels to the facade, have concrete floors and put a deck with reflecting pool on the roof. Oh, I was excited to do this project! Well, that was two years ago…and where’s that kit now? Sitting in my garage scratching its head next to the Artply Highland dollhouse that I had planned to mid-century modernize with the deliciousness of Eichler and Eames style. Sigh. Anyway, I felt compelled to share the idea with other modern mini enthusiasts who might have the skill—and more importantly, the follow through to undertake and complete the project. I still hope to put the kit(s) together one day. Is it corny for me to say “happy bashing”?